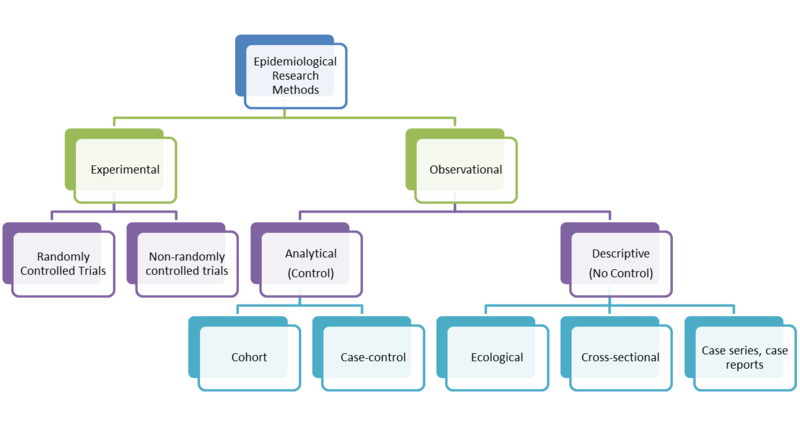 A cohort study is an epidemiological study design called an observational study. Observational studies differ from experimental studies in that the researcher does not control the assignment of people to groups. Instead the groups are 'observed'. Unlike experimental studies, observational studies do not look at the effectiveness of an intervention. A cohort study is an analytical observation study, i.e. it has a comparsion (control) group. Cohort studies follow up two or more groups from exposure to outcome. They compare the experience of one group exposed to a factor (exposed group) with that of the other which was not exposed to the factor (control group). If the exposed group has a higher or lower frequency of an outcome than the unexposed, then an association between exposure and outcome is evident. Cohorts look at causes and natural history of diseases and are also useful for examining prognosis of people who already have the disease. In a cohort study, precise choice of cohort depends on the nature of disease under investigation. It is worth noting that the term 'cohort' is also used in relation to a group of people who share a similar experience at a point in time, e.g. birth cohort. A cohort can sometimes be used to mean a group of individuals followed over a period of time to examine the cause or progress of disease (or physiological variable) or to chart its long term effects. Cohort studies can be designed to be prospective or retrospective. Prospective design allows exposure to risk factors to be assessed directly and confounding variables to be considered. A retrospective design is effective for diseases with a long development time. Sometimes referred to as historical cohort studies, they offer the advantage of speed and low cost compared to a prospective cohort. Historical cohort studies should not be confused with case-control studies (also retrospective). Cohorts track people forward in time from exposure to outcome. Case control studies trace backwards from outcome to exposure. Aim is to see if incidence of the disease is greater in people exposed to a suspected cause than in those not exposed. Numbers must be large enough so that an appreciable number of people in either group will succumb to the disease. Aim is to compare the outcome of different groups of patients who have suffered from a specific disease and follow them to find out what the outcome will be. Can be used to compare two different forms of treatment over the long term. All participants (both exposed and unexposed) in a cohort study must be at risk of developing the outcome. Controls should be similar to the exposed in all important aspects, except for the lack of exposure. This will reveal the background rate of the outcome in the community. For common exposures (e.g. smoking), a general population cohort is good as it enables internal comparsions of exposure status and the population can be motivated and easy to follow up. For rare exposures, the cohort may be defined by geography/environmental exposure or cohort could be defined by occupation, e.g. asbestos workers. Cohort studies should have a clear, unambiguous definition of the exposure at the outset. Measurement can consist of records, environmental monitoring, lifstyle questionnaire or a clinical/biochemical/molecular measurement. This is a challenge. Drop outs affect the study's validity. Drop outs are not random events. If the likelihood of droping out is related to the exposure and outcome, then bias can result. For example, if people are suffering side effects from a particular drug, they may drop out and so the drug may look better than it actually is. To optimise follow up, try to get a stable population, motivate them and do regular contacting and tracing. Outcomes must be defined in advance and should be clear, specific and measurable. Outcome can be measured with records, interview or examination. Risk can be measured with relative risk (a measure of the extent to which those exposed to a risk factor are likely to get the disease compared with the non-exposed group); absolute risk (this is the incidence rate for a group exposed to a risk factor); attributable risk (this is the difference in the incidence of a disease between the exposed and the non-exposed groups). Validity of results can be seriously affected by losses to follow up. Grimes, D.A. & Schultz, KF. (2002) "Cohort studies: marching towards outcomes". The Lancet, 359, 341-45.